Launching today, THE DIGITAL EINSTEIN PAPERS is a publicly available website of the collected and translated papers of Albert Einstein that allows readers to explore the writings of the world’s most famous scientist as never before. 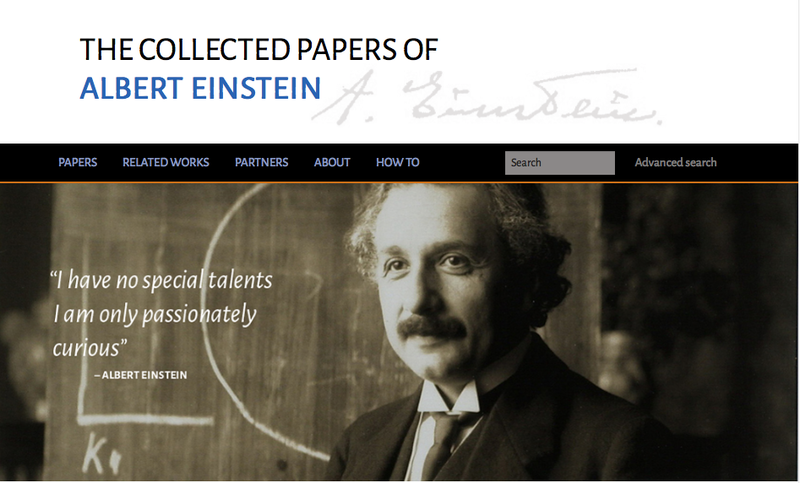 Princeton, NJ – December 5, 2014 – Princeton University Press, in partnership with Tizra, Hebrew University of Jerusalem, and California Institute of Technology, announces the launch of THE DIGITAL EINSTEIN PAPERS (http://einsteinpapers.press.princeton.edu). This unique, authoritative resource provides full public access to the translated and annotated writings of the most influential scientist of the twentieth century: Albert Einstein. THE DIGITAL EINSTEIN PAPERS website presents the complete contents of The Collected Papers of Albert Einstein, and, upon its launch, the website—http://einsteinpapers.press.princeton.edu—will contain 5,000 documents covering the first forty-four years of Einstein’s life, up to and including the award of the Nobel Prize in Physics and his long voyage to the Far East. Additional material will be available on the website approximately eighteen months after the print publication of new volumes of The Collected Papers. Eventually, the website will provide access to all of Einstein’s writings and correspondence, accompanied by scholarly annotation and apparatus. THE DIGITAL EINSTEIN PAPERS enables readers to experience the writings of Albert Einstein in unprecedented ways. Advanced search technology improves discoverability by allowing users to perform keyword searches across volumes of Einstein’s writing and, with a single click, navigate between the original languages in which the texts were written and their English translations. Further exploration is encouraged by extensive explanatory footnotes, introductory essays, and links to the Einstein Archives Online, where there are thousands of high-quality digital images of Einstein’s writings. The Tizra platform was selected for this project, according to Kenneth Reed, manager of digital production for Princeton University Press, because of its highly flexible, open, and intuitive content delivery approach, and its strong reputation for reliability. Equally important was creating a user-friendly reading experience. THE DIGITAL EINSTEIN PAPERS is an unprecedented scholarly collaboration that highlights what is possible when technology, important content, and a commitment to global scholarly communication are brought together. We hope you will join us in celebrating this achievement and invite you to explore Einstein’s writings with the links below. Work on THE DIGITAL EINSTEIN PAPERS was supported by the Harold W. McGraw, Jr. endowment, the California Institute of Technology, the National Science Foundation, the National Endowment for the Humanities, and the Arcadia Fund, U.K.
Letter to Mileva Marić — The first volume of The Collected Papers of Albert Einstein revealed that the young Einstein had fathered an illegitimate daughter. In this letter to his sweetheart and future wife, Einstein, age twenty-two, expresses his happiness at the birth of his daughter Lieserl, and asks about her health and feeding. Einstein’s first job offer — Einstein graduated from university in 1900, but had great difficulty finding academic employment. He received this notice of his appointment as a technical clerk at the Swiss Patent Office in June 1902 and would later describe his time there as happy and productive. “On the Electrodynamics of Moving Bodies” — Einstein’s 1905 paper on the special theory of relativity is a landmark in the development of modern physics. “On a Heuristic Point of View Concerning the Production and Transformation of Light” — Einstein received the Nobel Prize in Physics for this paper on the hypothesis of energy quanta. The telegram informing that Einstein he has won the Nobel Prize — Einstein was traveling in the Far East when he officially learned via telegram that he had been awarded the prize. However, he had long been expecting the prize, as evidenced by a clause regarding its disposition in a preliminary divorce agreement from Mileva in 1918. “The Field Equations of Gravitation” — Einstein spent a decade developing the general theory of relativity and published this article in late 1915. To his mother Pauline Einstein — Einstein writes to his ailing mother to share the happy news that his prediction of gravitational light bending was confirmed by a British eclipse expedition in 1919. Four Lectures on the Theory of Relativity, held at Princeton University in May 1921 — On his first trip to the United States, Einstein famously delivered these lectures on the theory of relativity. The Collected Papers of Albert Einstein is one of the most ambitious publishing ventures ever undertaken in the documentation of the history of science. Selected from among more than 40,000 documents contained in Einstein’s personal collection, and 15,000 Einstein and Einstein-related documents discovered by the editors since the beginning of the Einstein Project, The Collected Papers provides the first complete picture of a massive written legacy. When completed, the series will contain more than 14,000 documents as full text and will fill thirty volumes. The volumes are published by Princeton University Press, sponsored by the Hebrew University of Jerusalem, and supported by the California Institute of Technology. Princeton University Press is an independent publisher with close connections, both formal and informal, to Princeton University. As such it has overlapping responsibilities to the University, the academic community, and the reading public. Our fundamental mission is to disseminate scholarship (through print and digital media) both within academia and to society at large. Tizra’ digital publishing platform makes it easy to distribute and sell ebooks and other digital content directly to readers, with exceptional control over the user experience. Combining intuitive control panels with integrated ecommerce, SEO, mobile, multimedia, and content remixing capabilities, Tizra empowers content owners to respond quickly to market feedback and build audience relationships that will hold up over the long haul. The company is headquartered in Providence, Rhode Island, and funded in part by Rhode Island’s Slater Technology Fund.